Roscommon produced a mature display of attacking football to take their place in the under-21 All-Ireland final. ROSCOMMON NEEDED ALL of their mettle to withstand a thrilling Cork comeback in today’s All-Ireland under 21 semi-final in Portlaoise. For long stretches, the Connacht champions were the dominant team, but the Rebels’ ability to hit the net ensured the sides were level in stoppage time before Diarmuid Murtagh curled over a nerveless injury time free from the right sideline. 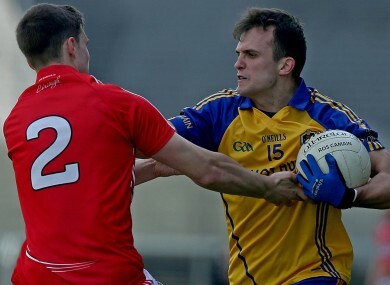 Cork produced the best of the early running, but Roscommon held them scoreless for 20 first half minutes while they racked up a host of brilliant points from open play to take a 0 – -5 to 0 – 11 lead into the second half. Cork would start the second half as well as the first, but it was only when they began to find the net that the game really began to sink back into the melting pot. Mark Sugrue was the first to raise the green flag after 32 minutes to make the deficit just three points. Roscommon displayed tremendous poise throughout the team and were able to keep the scoreboard ticking over with frees from Murtagh even when the momentum was turning Cork’s way. Because of that poise, Cork’s second goal via Alan Cadogan only brought them to within two points at 2 – 09 to 0 – 17 after 48 minutes. Ultan Harney delivered an emphatic response four minutes later with a piledriver into the top corner of the Cork goal, but still Cork would not be shaken off. With three points between the sides entering stoppage time Dan MacEoin, who was Cork’s shining light throughout, lined up a close-range free. And despite the yellow jerseys on the line, injected enough power to find the top corner. Roscommon boss Nigel Dineen was preparing for injury time, but Murtagh had the range, accuracy and cool head needed to end the game in the third minute of injury time and send Roscommon into the All-Ireland final. Roscommon scorers: D Murtagh (0-10, 7fs); U Harney (1-01), T Corcoran (0-02, 1 ’45′, 1f) E Smith (0-02); C Kilcline (0-01), M Healy (0-01), ; D Smith (0-01). R Daly (0-01).Cork scorers: D MacEoin (1-06, 1-03fs), M Sugrue (1-03), A Cadogan (1-02), S Kiely (0-01). Cork: Micheál Martin; Jamie Davis, Conor Dorman, Stephen Cronin, Brian O’Driscoll, Seán White, Kevin Crowley; Kevin Fulignati, Ian Maguire; Killian O’Hanlon, Mark Sugrue, Sean Kiely; Dan MacEoin, John Corkery, Alan Cadogan. Email “Roscommon take place in All-Ireland final, staying cool to withstand late Cork comeback”. Feedback on “Roscommon take place in All-Ireland final, staying cool to withstand late Cork comeback”.